With the advent of new high tech materials and smaller sized micro chips, most products today have evolved into miniaturizations of themselves eliminating extra weight and increasing user friendliness. These were some of the very best and most useful products we saw at the Show. 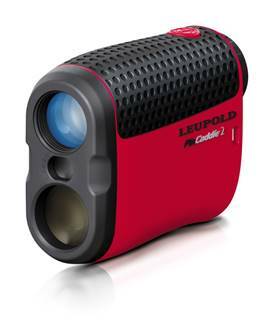 This unit is simply the best range finder currently available! Its sleek design together with the ergonomic design and visual reading meter, is simply awesome! Weighing only 6.3 ounces, PinCaddie 2 features Leupold’s exclusive PinHunter® Laser Technology and a ranging engine that eliminates false readings caused by background hazards, like trees and bushes. This feature assures golfers are ranging their target, not what’s behind it. Other PinCaddie 2 features include a high-contrast LCD display, measurements in both yards and meters, a multi-coated lens system, one-touch scan mode, and a sleek, rubberized front cover and red finish. This new rangefinder is USGA 14-3 compliant and perfect for obtaining line-of-site measurements to the pin. Rugged, compact and waterproof, PinCaddie 2 has 6X magnification, meaning you can magnify the target to six times its size and can range up to 650 yards. The PinCaddie 2 is available now and has a suggested retail price of $249.99. 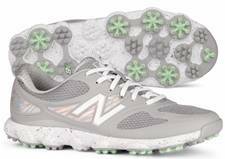 The NBGW1001 golf shoe is built on the same Minimus® Last in New Balance’s popular low-profile running and training shoes. The NBGW1001 features a breathable, water-resistant mesh upper with no-sew synthetic overlays. The REVLite® 4mm drop* midsole provides lightweight cushioning and premium responsiveness, while an Ortholite® insole provides cool, dry comfort close to the foot. 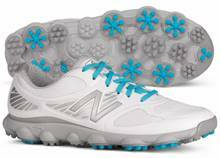 The dual density integrated spikeless outsole provides traction and maintains the shoe’s minimal profile. The NBGW1001 weighs just 6.7 ounces and is available in two colorways; grey with a hologram insert and white with grey highlights in sizes 6 -11, B and D widths in the grey and B width in the white for a suggested retail of $89.95. The NBGW1004 is built on a New Balance SL-2 last and features a premium waterproof leather upper and a REVLite® 10mm drop* midsole. The outsole is made of NDurance, a rubber compound for maximum durability in high wear areas and uses the Champ® Slim-Lok® Zarma®** Tour cleat system. 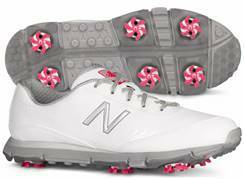 The NBG1004 weighs just 8.9 ounces and is available in a white colorway with subtle grey and pink accents in sizes 6 -11, B width for a suggested retail of $119.95. The NBGW1004 is backed with a 2-year waterproof warranty. 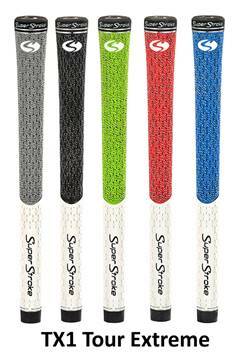 Now SuperStroke has introduced their new SuperStroke TX1 Premium Club grips. These grips are not oversized nor non-tapered like the putter grips. They definitely improve grip over the entire surface. The TX1 Club Grips are a proprietary blend of two rubber compounds melded into one grip for a dynamic blend of control and feel. The top portion is a soft, cord infused rubber that provides excellent control. The bottom portion is a softer, non-cord rubber that provides the feel and feedback players demand, especially on shots around the green. The TX1 Club Grips will be available in five colors (Black/White, Red/White, Blue/White Grey/White, Green/White) and have a mid-size version available in Black/White. The TX1 Club Grips retail for $10.99 and the mid-size version retails for $11.49 and is available online at superstrokeusa.com and at leading retailers. There’s a brand-new golf grip material quickly gaining popularity. The Cork Tree has debuted four new putter grips made of cork leather. Why cork? It’s proven to be the perfect complement to leather in a grip. Cork leather putter grips provide an overall user experience that cannot be achieved with any other putter grip material known to man. Cork is 100% natural, feels soft in the hands, and improves its playability well beyond other materials when a golfer’s hands are hot or sweaty — as well as in humid playing conditions. 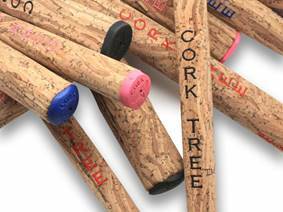 Cork Tree putter grips are designed and used by Championship winning Tour professionals who make their living from playing golf. There are currently more than twenty PGA Tour players using Cork Treecork leather putter grips including Danny Willett, the winner of the recent Nedbank Golf Challenge in South Africa. 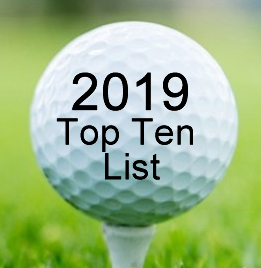 Liang Wen- Chong, with 17 career wins, including wins on the European Tour, Asian Tour, Japan Golf Tour, and OneAsia Tour, is also using the Cork Tree putter grip. The four initial putter grips include the Midsize ($29.95), Feather Light ($29.95), Parallel ($29.95) and Tour ($29.95) models. They’re all extremely durable, absorb any impact vibration and are impermeable to water. Bette & Court, a division of Sport-Haley, Inc. is a premier women’s golf apparel company committed to the active woman interested in fresh, sporty, modern and easy-to-wear clothing at an affordable price point. Offering effortlessly stylish and interchangeable pieces, Bette & Court’s clothing is designed with attention to quality, detail and fit that performs beautifully on and off the golf course. The Spring 2015 Bette & Court line continues to offer a modern twist to dressing for the active woman, while staying true to its core basics. 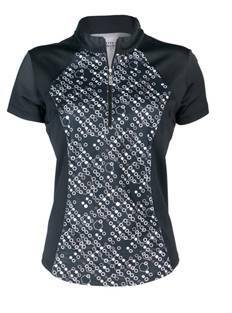 Bette & Court apparel is designed to meet the needs of the busy, younger- minded and active woman who wants “fashletic” or easy to wear, affordable clothing that performs well on the golf course, but also translates fashionably off the course. The Cool Elements Mock featured on the left, retails for $76.00. The new line, which includes three collections, is full of colorful personality, but easy to merchandise and designed with practicality in mind. The color blocking attributes bring a flattering twist to the short sleeve and sleeveless polos in each collection. Design details like heathered or printed fabrics, ombre zippers and mesh overlays add stylish touches to this season’s pieces. Using quality, high performing fabrics that fit and flatter, this seamless collection is a reflection of Bette & Court’s evolution as a fashion forward apparel brand. The three collections of the Spring 2015 line bring a fashionable twist and extension to Bette & Court core of essentials. With distinct bold color stories, fabric and styling crossover, the groupings can mix and match back to items already in a woman’s wardrobe. Bette & Court’s entire collection centers around the brand’s best-selling Cool Elements top, the original sun protection mesh sleeved polo, which can be worn on and off the course. In the Spring 2015 collection, Cool Elements tops come in, not only 15 color options, but also with two collar styles, six prints and the new Odyssey Mock, which features mesh detailing on the back, heathered fabrication, and thumb holes on the sleeves. The Bette & Court Axis short sleeve polo, looks great on. The zip Placket and mock neck give the polo an elegant look. It retails for $60.00. Providing SPF 30+ sun protection, these textured tops can reduce body temperature with its cooling yarns and mesh vents under each sleeve for extra air circulation. 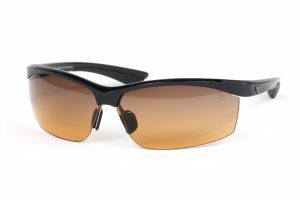 With fabric that is lightweight, anti-microbial and moisture wicking, Cool Elements products are perfect for lightweight sun protection. New this season is the “Jackable”. This full zip jacket is a soft, lightweight, water resistant piece that can be folded into a small pouch and packed easily into a golf or gym bag. Also new is the “Transition” jacket, space dyed with a peached fleece inner fabric that keeps the body warm against the elements. Desert Dry™ technology absorbs and wicks moisture quickly and evenly, achieving the most-efficient evaporation possible to keep golfers comfortable and dry. Meanwhile, Desert Dry™ Xtra-Lite combines the Desert Dry™ moisture-wicking feature with specially constructed ultra-light fabrics for maximum wicking performance and optimum comfort. New additions to this category are 100% poly fabrics that feel and look like cotton. The garments feel like cozy cotton, but handle perspiration like poly. These new cotton-like poly fabrics open up a whole new world to consumers, who can have the comfort of their favorite tee while maintaining the ease of poly’s wear and wicking power. For more details on Antigua’s 2015 Men’s Golf Collection, visit www.antigua.com. 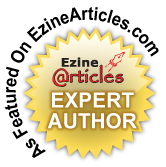 Yves C. Ton-That, a rules official and best selling golf author, has written a new booklet called “Golf Etiquette Quick Reference. A Golfer’s Guide to Correct Conduct”. The new booklet covers everything golfers of all skill levels need to know, so that they can play any course in the world with confidence – from preparing for the round at home to enjoying a drink at the 19th hole, to safety, to courtesy, to fixing divots – the code of conduct is explained in the usual concise and understandable way. The guide is also extensively illustrated in color and is the perfect complement to the Golf Rules Quick Reference. Sport Haley – Passion Personified! For more than 28 years, Sport Haley has been offering women timeless, classic and elegantly designed clothing for the golf course and clubhouse. And this year is no exception. Fabrics for Spring 2015 are lighter and more technical overall. Sport Haley’s signature fabric, Haley Cool, is superior in performance and has inherent cooling yarns so the fabric not only has wicking properties, but also is cool to the touch. 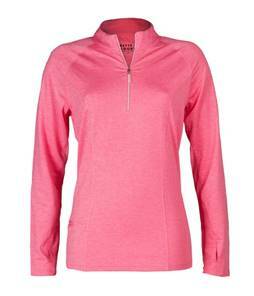 With a UPF 30 and a slight texture, it is the perfect performing fabric. The Spring 2015 collection is influenced by gardens, flowers and vibrant color. Each of the five groupings has its own personality, but pieces are interchangeable within each group and beyond. The traditional, but updated elements of Viola Vineyards; the modern, athletic and graphic pieces from Clover Lane; the feminine and floral Petal Path line; and, the classic look of bright blue and white in the Burchfield create a timeless, varied, but cohesive Spring 2015 collection. The beautiful florals, bold graphics and simple geometric patterns each have a place in a woman’s wardrobe. Silhouettes are streamlined with clean and crisp lines, and the colors, textures, prints and patterns take center stage. Haley, the brands’ signature owl, is thoughtfully placed as embroidery, zipper pulls or decorative touches throughout. The attention to detail in Sport Haley clothing speaks to the fine quality the brand is known for. Fabrics for Spring 2015 are lighter and more technical overall. Sport Haley’s signature fabric, Haley Cool, is superior in performance and has inherent cooling yarns so the fabric not only has wicking properties, but also is cool to the touch. The Sport Haley Boutique also offers lifestyle pieces with a touch of glamour. Foiled or metallic yarns, crystals and faux fur vests in a textured detail rose fabric add some extra special flair to every lifestyle. Sport Haley also offers basics, outerwear and complementary accessories such as Swarovski Crystal Element bracelets and scarves. By tapping into the mindset of the modern woman and her lifestyle today, Sport Haley knows it’s about the ease and comfort of dressing and the changing rules. The new chic is stylish comfort, whether it be an athletic pant worn with a blazer, a functional performance pant worn with a bit of cashmere and scarf, or a foiled holiday polo with both function and shimmer. 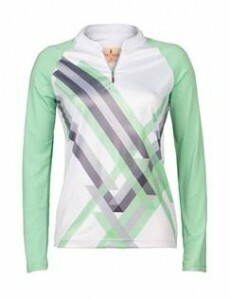 Sport Haley apparel and outerwear is marketed in the premium and mid-price golf markets through a network of independent sales representatives and distributors to golf professional shops at country clubs, resorts and boutiques throughout the U.S. and a variety of channels internationally. On average, Sport Haley pieces typically retail at $76 per item. 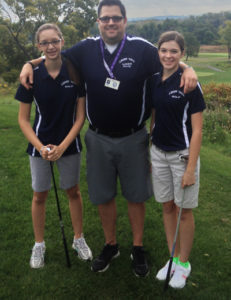 The company also markets golf and fashion apparel to corporate, college, university and other markets. Now FootJoy’s Boa device will also be available for those golfers who have come to love and enjoy the flexibility and comfortability the Boa offers. His latest book, “The Right Mind for Golf”, released last year, is now in its 6th printing and available on Amazon. 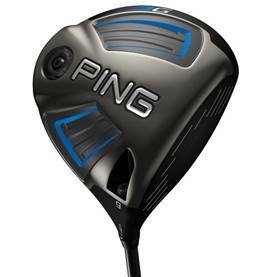 This entry was posted on Friday, April 24th, 2015 at 3:54 pm and is filed under Golf Equipment Reviews. You can follow any responses to this entry through the RSS 2.0 feed. Both comments and pings are currently closed.